By the second day of the stock take challenge, most of the fresh fruit and veg had been consumed, and I was forced to rely on the store cupboard. With no bananas left in the house, I opted for long-lasting raisins as fruit with my breakfast porridge. 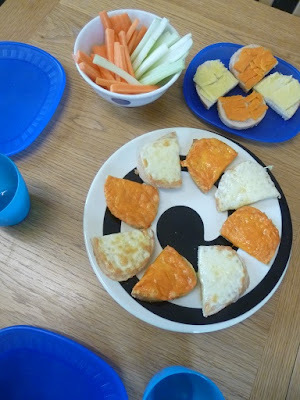 Lunch was a salad made out of odds and ends, then in the evening the children got to eat cheese on toast with chopped carrot and celery, a bit of mango and a yogurt, while we raided the cupboard to make veggie chilli. 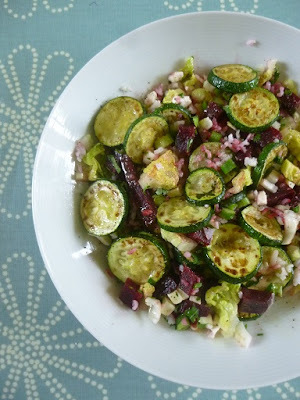 Here’s a photo of lunch conjured up from the limited fresh veg left in the fridge – a salad of beetroot, spring onions, celery, a tired little gem lettuce, the last courgette and 20g of the Aldi version of feta, bulked up with some of last night’s leftover rice. It actually turned out pretty well, with a good combination of crunchy stuff, salty cheese and the softness of the cooked courgette. I used the half lemon lingering in the fridge to make a salad dressing, shaken up with olive oil, dijon mustard, seasoning and a scant teaspoon of sugar. Cheese on toast. Oldie but goodie. For dinner, I needed something quick and easy before heading out to Brownies. Safe in the knowledge the children had eaten spaghetti bolognese as school lunch, I opted for cheese on toast. This used up some of the crumbly cheese I’d frozen after buying large-sized packs. I offered carrot sticks and celery for greenery, mango chutney to liven up the cheese on toast, and then some fresh mango and yogurt tubes for pudding. My daughter also put in a request for raisin cookies. 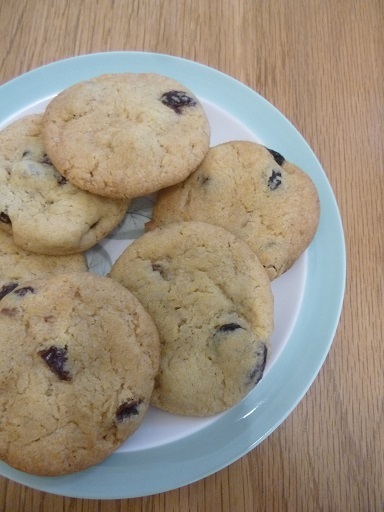 This quick and easy Netmums recipe makes delicious chewy cookies, based on only six ingredients. I had to tweak the recipe according to what we had in the house though. I susbstituted raisins for chocolate chips, Stork for butter, and a mix of demerara sugar and caster sugar in the absence of soft brown sugar. I also had to boost plain flour with baking powder because we’d run out of self-raising flour. With Aldi ingredients for everything but the Stork (£2.05 for 1kg) and Lyle’s Golden Syrup (£1.15 for 454g) I reckon these cookies cost 48p for 16, which is 3p each. 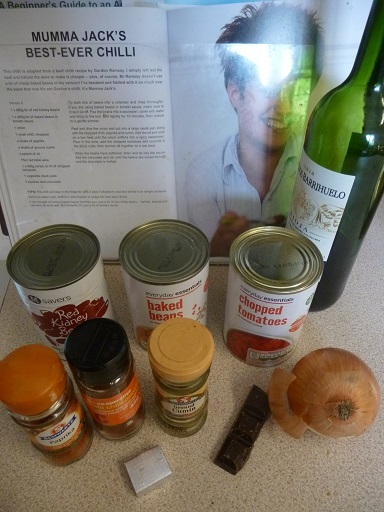 For dinner, I fell back on a store cupboard stalwart: Mumma Jack’s Best Ever Chilli from A Girl Called Jack’s cookbook. 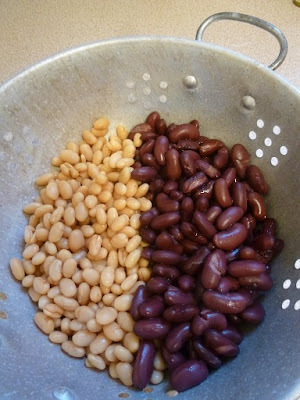 It’s a real winner when the fridge is bare, as it relies on tins of tomatoes, kidney beans and baked beans, plus a bit of red wine, a stock cube, paprika, cumin and chilli powder (as I didn’t have any fresh chillies), a few squares of chocolate and an onion. The ingredients I used for the chilli cost £1.50, which made 3 decent portions including one for my husband’s lunch tomorrow, so 50p each. We ate it with brown long grain rice, which takes so long to cook that I made a big enough portion for tomorrow’s lunch as well. Almost the only fresh veg we had left was the remains of a savoy cabbage, so I steamed some over the rice towards the end of the cooking time. The rice and cabbage together added about another 15p a head, so 65p each in total for our evening meal. 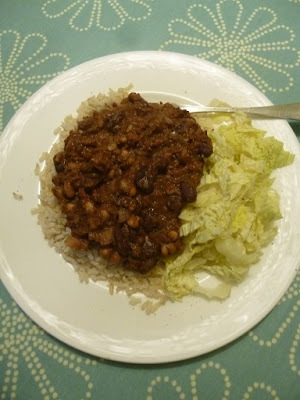 I really like Mumma Jack’s best ever chilli, with that added extra from the dark chocolate, and think her suggestion of rinsing cheap baked beans is a great way of getting cannellini beans without paying extra. I snacked on yogurt with mango and the final strawberries, plus a sneaky crumpet and jam. Facing ever emptier fridge shelves, I realised it was finally time to stock up on fresh fruit and veg, so I could supplement the stock piles in the cupboards and freezer. What recipes do you rely on when the fridge is bare?